Importers and distributors of European motorcycles, parts and accessories. We are the New Zealand agents for Nolan helmets, Spidi clothing, Moto Morini motorcycles, Givi luggage systems, Regina chain, Chiaravalli sprockets, Scorpion mufflers, Brembo brake systems and many more. Ericksen Honda in Napier held a motorcyclist open day on Sunday 20 November 2011, to promote rider safety on Hawkes Bay roads (they ran it last year as well, and hope to run it annually). 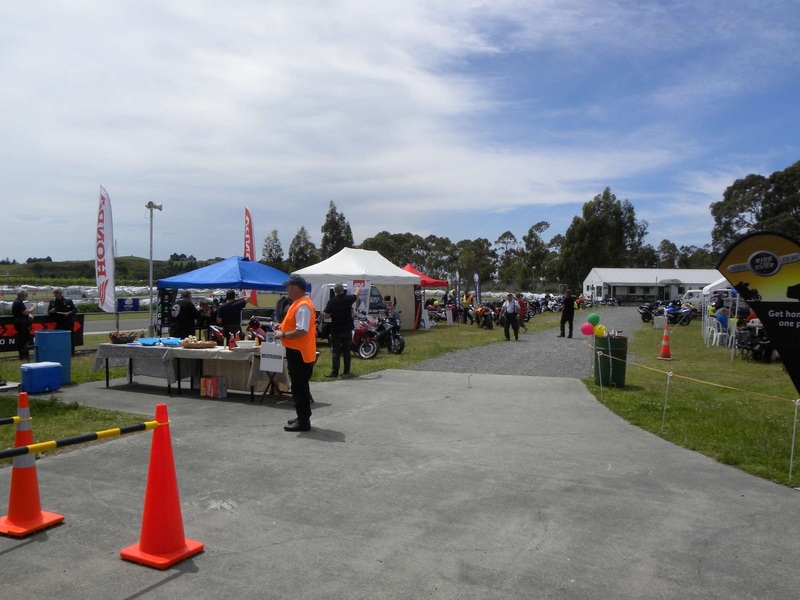 It is a practical training day aimed at improving rider skill and safety on the road, and there are a variety of activities designed to raise your skill level with On Track training. 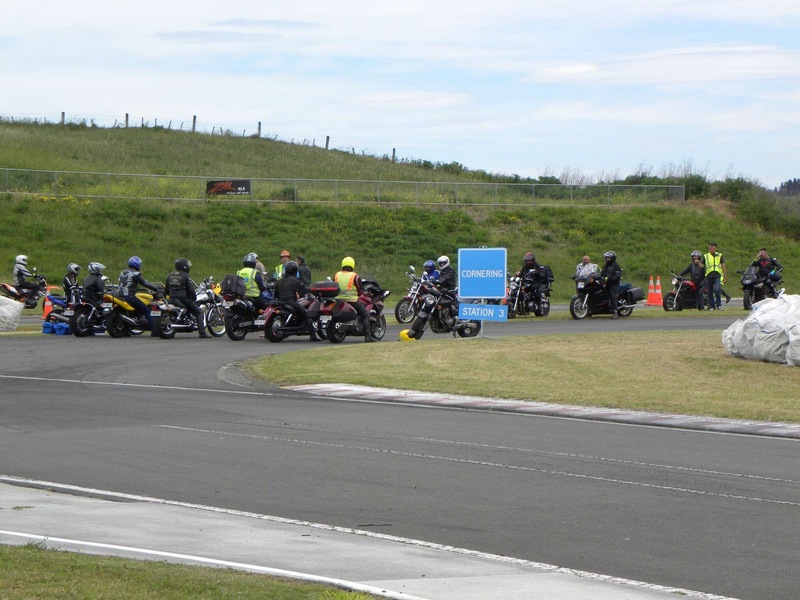 Various stations around the track focus on different skill sets, eg: Braking, Low speed Maneuvering, Cornering, etc. They also offer free bike checks, safe rider training, spot prizes, and a free BBQ Lunch. The day was a huge success with more riders on the track than last year, as well as great weather (as per normal for Hawkes Bay). 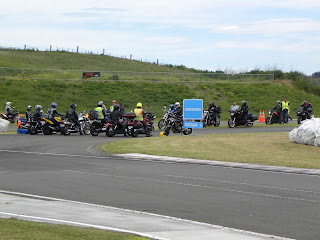 Ericksen Honda, ACC, NZ Police, Road safe Hawkes Bay, NZ Ulysses, Pacific Motorcycle Club. Check out some of these great new styles from Italian manufacturers Spidi. This latest collection has been selected with New Zealand conditions in mind, and showcases some outstanding new features. You can find the full collection, including price and availability on our main website. 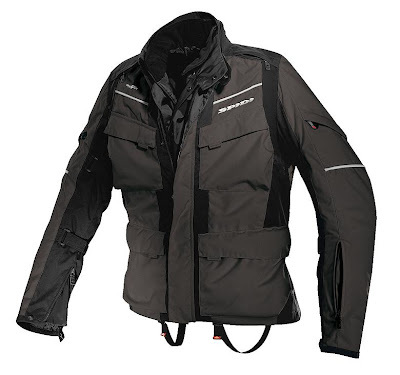 Extremely versatile three-layer jacket with fully removeable liners. EXTERNAL SHELL - Tenax polyamide 212gr for sq with Tenax Flex stretches over shoulder blades for easier riding position. Inner mesh liner for sweat dispersion. CE Force Tech protector kit for shoulders and elbows/forearms. Optional chest and back protectors. Reflex areas. Optional safety lamp for night riding. Dynamic vents on sleeves, two vents on shoulders, two rear air vents to increase air circulation. Double windproof zip cover to increase efficiency of H2OUT membrane. Groin straps. 5 pockets (2 waterproof) and 2 waterproof inner pockets. 2ND LAYER - A light H2OUT jacket, removable, with inner pocket and drawstring around the waistline. High collar protects against chilly air and water. 3RD LAYER - Insulating 250gr liner with aluminium inserts. 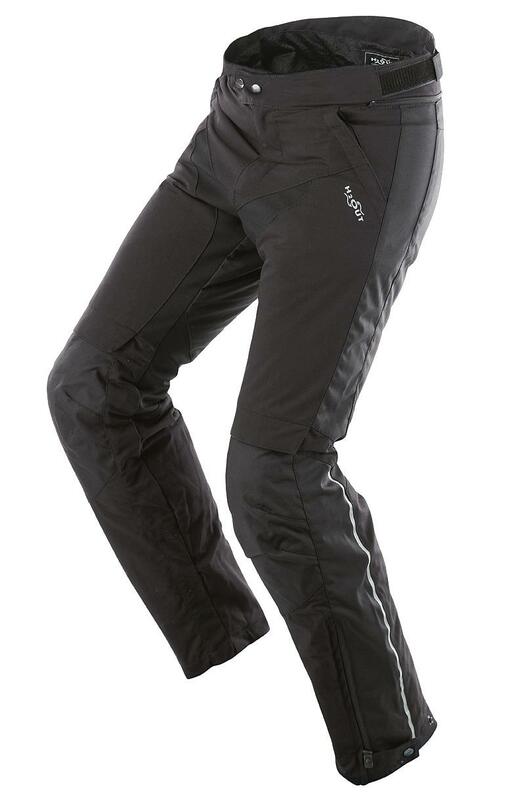 Aluminium helps keep the body heat inside with minimal dispersion. With handy stretches around the waistline. Also available in womens fit. For a full list of sizes and colours available click here. Also available in Short Leg. For a full list of sizes and colours available please click here. Eurobike has been working with Kiwi chemical specialists Chemz to create a range of products specifically for motorcycles. The three products are Spray Clean, Bike Shine, and Chain Lube, which comes in two different sizes. Chemz Moto MX3 Chain Lube is formulated for use on all motorcycle chains, including O-Ring. Penetrates inner pins, rollers and bushings, and after propellant evaporates, thickens to a long lasting lubricant. Reduces noise, wear and friction for increased chain life. Contains an adhesive lubricant which resists high speed fling-off. Has a wide temperature range of -30ºC - 180ºC, and is resistant to salt water. Available in a big 500ml can or handy 250ml can. Chemz Moto MX4 Bike Shine is suitable for helmets, gloves, leathers, boots, mudguards, fairings, engines, exhausts, tyres, instrument panels, screens, panniers and all surfaces requiring coating and long-lasting shine. Effective in preventing dirt from sticking to surfaces. 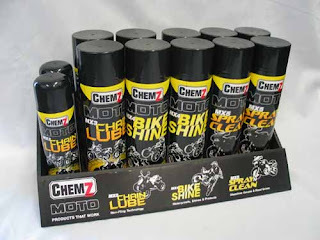 Chemz Moto MX5 Spray Clean is formulated with a unique combination of cleaning, degreasing and polishing agents. It effectively cuts through grease and grime, removing film from motorcycle tanks, fairing guards, pannier rims, cooling fans, exhausts, suspension and brake units. Cleans gently and is safe to use. Will not scratch or abraid. Chemz is 100% New Zealand owned and operated, and we have been using and selling their products for a couple of years now. This new range offers top quality and value for money, as well as the satisfaction of supporting a local industry. Introductory offers are available for significant discount, all pricing and availability is now available on Sprint3. Bike-Lift is one of our top selling lines, and we've just taken delivery of the latest shipment. 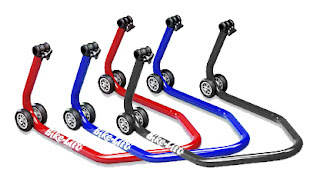 Bike-Lift make a variety of front and rear paddock stands to suit almost any bike, including both left and right single-sided swingarms. They are Italian built to a very high standard with toughened plastic castors. The rear stands come with a choice of rubber blocks or v-type cursers. With the track day and racing season now well underway, these stands are fast sellers and essential for display on the shop floor. For more information click on the Bike-Lift link in the menu on the right of the screen. 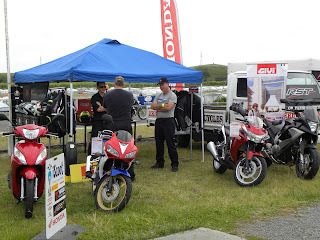 We are in Wellington this weekend at the Motorcycle Expo hosted by Motomart. Hundreds of people are here checking out the bargains, so if you're in Wellington come down and have a look. The Expo is open from 9am - 4pm all weekend at the Overseas Terminal on Chaffers Wharf. Last weekend we attended the MotoTT track day at Manfield, which enjoyed a good turnout, despite the weather. Nearly 60 riders turned out to brave the wind and rain to get some laps in. 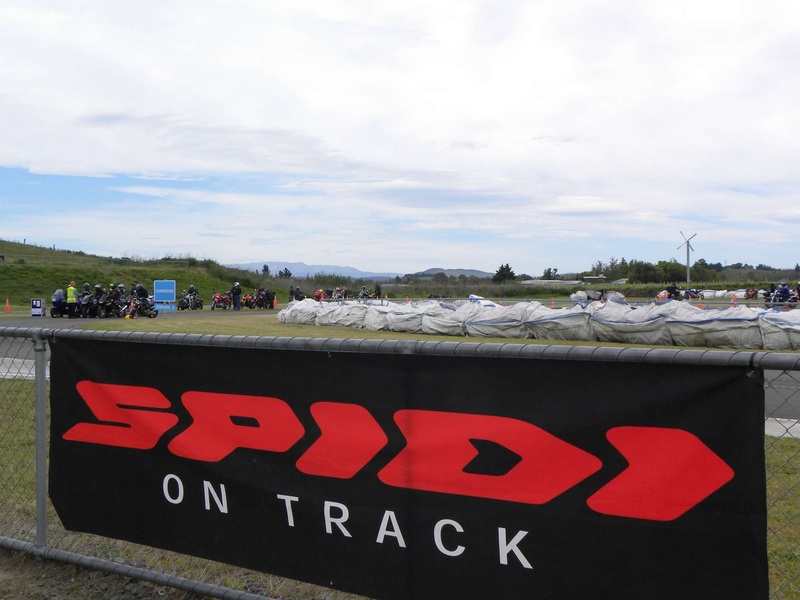 This Sunday we will be heading up to Pukekohe, and we'll have a selection of Spidi race suits, gloves, boots, stands, Brembo race day brake parts and a range of tools from Dragon Stone and Buzzetti. Please call in and see us if you would like to check out some of this great kit.